His lord said to him, Well, good and faithful bondman. Thou were faithful over a few things, I will appoint thee over many things. Enter thou into the joy of thy lord. His lord said unto him, Well done, good and faithful servant: thou hast been faithful over a few things, I will set thee over many things; enter thou into the joy of thy lord. His master said to him, Well done, you upright (honorable, admirable) and faithful servant! You have been faithful and trustworthy over a little; I will put you in charge of much. Enter into and share the joy (the delight, the blessedness) which your master enjoys. His lord said to him: Well done, good and faithful servant; you have been faithful over a few things, I will make you ruler over many. Enter into the joy of your lord. His lord said to him, Well done, good and true servant: you have been true in a small thing, I will give you control over great things: take your part in the joy of your lord. his lord said to him, well done, good and faithful servant; thou hast been faithful in a small trust, I will give thee a much larger trust: go in and partake of your master's joy. His lord said to him, Well, good and faithful bondman, thou wast faithful over a few things, I will set thee over many things: enter thou into the joy of thy lord. And his lord said to him, Well done, good and faithful servant; thou wast faithful over few things, I will make thee ruler over many things: come thou into the joy of thy lord. His lord said to him, Well done, good and faithful servant: thou hast been faithful over a few things: I will set thee over many things: enter thou into the joy of thy lord. His lord said unto him, Well done, good and faithful slave; thou hast been faithful over a few things; I will set thee over many things; enter thou into the joy of thy lord. His lord said to him, Well, good and faithful servant; thou wast faithful over a few things, I will set thee over many; enter into the joy of thy lord. His lord said unto him, Well done, good and faithful servant; you have been faithful over a few things, I will make you ruler over many things: enter into the joy of your lord. 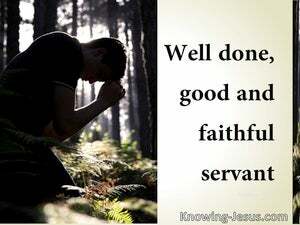 His lord said to him, Well done, good and faithful servant! You have been faithful over a few things, I will make you ruler over many things. Enter into the joy of your lord. 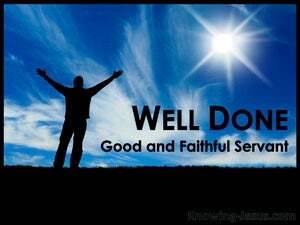 His lord said to him, Well done, good and faithful servant! thou hast been faithful over a little, I will place thee in charge of much; enter into the joy of thy lord. His Lord said to him, Well done, good and faithful servant; you have been faithful over a few [talents], I will place you over many: enter into the joy of your lord. His lord said unto him - Well-done! good and faithful servant, - Over a few things, wast thou faithful, over many things, will I appoint thee: Enter into the joy of thy lord. His master said to him, Well done, good and faithful servant: thou hast been faithful over a few things, I will place thee over many: enter thou into thy master's joy. His lord said to him, Well done, good and faithful servant; thou hast been faithful over a few things, I will make thee ruler over many things: enter thou into the joy of thy lord. his lord said to him, Well done, good and faithful servant, thou hast been faithful in a few things, I will set thee over many, enter into the joy of thy lord. 'His lord said to him, Well done, servant, good and faithful, over a few things thou wast faithful, over many things I will set thee; enter into the joy of thy lord. 22 "Also the one who had received the two talents came up and said, 'Master, you entrusted two talents to me. See, I have gained two more talents.' 23 "His master said to him, 'Well done, good and faithful slave. You were faithful with a few things, I will put you in charge of many things; enter into the joy of your master.' 24 "And the one also who had received the one talent came up and said, 'Master, I knew you to be a hard man, reaping where you did not sow and gathering where you scattered no seed. "She has done what she could; she has anointed My body beforehand for the burial. And He sat down opposite the treasury, and began observing how the people were putting money into the treasury; and many rich people were putting in large sums.